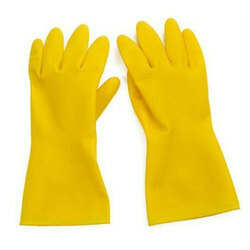 We are offering Rubber Hand Gloves in various sizes to suit the requirements of the clients. These are fabricated using superior quality natural latex which makes it comfortable and skin friendly. White, ambidextrous, powder-free disposable glove made of 100% Natural Rubber Latex. - Provides superior finger flexibility, dexterity and grip. Latex Examination gloves - any size . We are basically the importers of latex exam gloves and nitrile examination gloves based in Delhi . Due to the increasing rate of latex allergy among health professionals, and in the general population, gloves made of non-latex materials such as vinyl, nitrile rubber or neoprene have become widely used.